Rani Yahya and Ricky Simón travel to Melbourne with eyes set on the top 10 rankings. This will be a classic striker vs grappler match-up between the veteran Yahya who made his professional debut all the way back in 2002 and the young gun Simón who is making his third UFC appearance. Simón arrived to the UFC as the LFA bantamweight champion and carried his form over with a superb submission of Merab Dvalishvili on his debut and then earning a decision over Montel Jackson, stretching his winning streak to seven. Yahya is 11-3 (1) in the UFC and has submitted his last three opponents, which is all part of his trade as a Brazilian Jiu-Jitsu champion. Fighters know what to expect from Yahya but that does not make their game plan any easier as he as an elite grappler with a sensational 20 submissions. We know Yahya is going to try and take the fight to the ground as soon as possible. 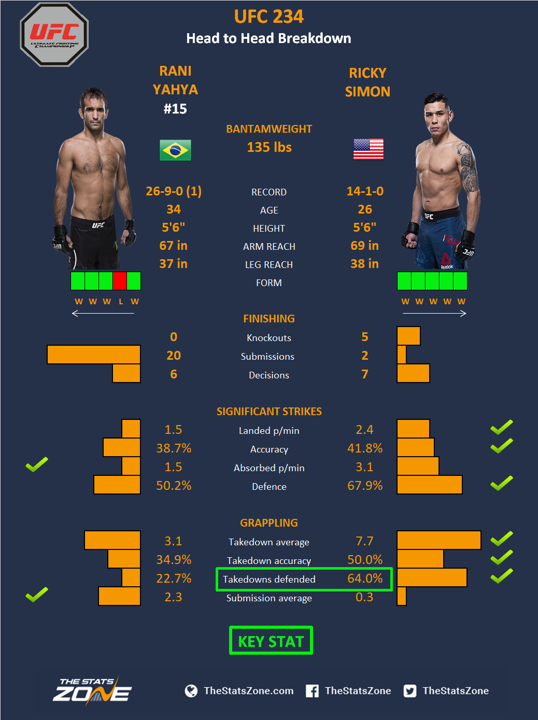 Simón is incredibly dangerous on the feet and as Yahya has never won via knockout, Simón will put all his focus into defending the takedown. Yahya only has a takedown accuracy of 22.7% but he will be relentless in his attempts, and as it is only a three-round fight he only needs a few successes to close the fight out. That said, Simón has the ability to avoid the submission threat and is likely to cause damage on the feet, but Yahya has the durability to take it to a decision.